Having reached this point of your Ascension Pathway, you have now received, digested and assimilated a great many layers of 'New Consciousness' energies. You have been guided through a great many ascensions, energetic upgrades and vibrational uplifts and with all this being complete, you are now ready to start walking on The Grand Ascension Pathway. Here, you will be guided towards taking many significant steps forward as you open up to three new sets of 'Grand New Consciousness' energies; including The Grand New Golden Consciousness, The Grand New Silver Consciousness and The Grand New White-Wisdom Consciousness. We hope you enjoy receiving this beautiful array of Grand New Consciousness energies in your life and may you radiate these lovingly, benevolently and gracefully for the infinite benefit of all beings. “Greetings and welcome Divine Ones to The Grand New Golden Journey; a new plateau of intensive and resonating frequencies to bring you closer to your Truth, Divinity and One-ness. This exceptional new level of divine frequency gives birth to a Grander state of consciousness and a most collective and unified way of embracing it. The energies are swift, accelerative and beckoning! Enjoy." "Volume One brings us into a period of deep challenges and massive rewards as we are presented officially to The Grand Council Of Consciousness for birth into the Grand sequence of energetic frequencies. Having now completed the transition through the portal of light you have accelerated through the Grand Merger Junction and are now ready for entrance through The Grand Golden Gates to begin your Grand New Consciousness journey." "You have already endured countless eons of energetic frequencies and now it is time to change the manifestation rate and ascension rate that you have previously known and been attuned to. For here in the Volume Two energies you are swiftly swept up into a Grand Golden Ascension; an incredible and powerful whirl-wind of ascension, breaking through to a higher cosmos of galactal understanding. At present your Earth plane is awash with outdated frequencies that are not true to the consciousness, and this elevation of Volume Two energies is a plight to help clear all outdated and dirty, rusty or clogged frequencies that simply do not serve the collective. Your heightened vibration as a result of this cleansing is much needed by your Earth and all consciousness at this time." “Welcome To The Grand Silver Staircase. With light and divine love we offer you our greatest blessings and humblest praise for reaching this divine level of being. The Grand Silver Staircase is a delight of three stages through which you will emerge at a grander depth of divine Silver Light. The pathway forwards encompasses receiving The Grand Silver Cloak, an energetic envelope of energies readying you for The Grand Abundant Silver Light in Chapter Three. Both of these energetic changes bring forth great opportunities for peace within as new healing layers are uncovered and new answers revealed. Here we take care to understand our root cause nature further, which in turn develops our patience (and forgiveness) for both ourselves and others. The more we heal, the more layers of unease we treat - and the more likely we are to be patient, loving and kind. These seemingly small requests are rather large and tangible as we step through the phases of The Grand Silver Staircase." “Welcome to Volume Four and The Grand Silver Doorway. Having now completed your Grand Silver Staircase, your energies are ripe and ready to be fulfilled with more layers of deepened Grand Sliver Consciousness. Opening your Heart Chakra through many more defined and required light elements, you shall find yourself ready and waiting for The Grand Silver Doorway." "This extremely special and deeply humbling doorway opens into a tunnel of light which transcends you through hundreds of layers of Grand Silver Consciousness intermittent light. Here you are gifted with a series of simple attunements using activation codes, which propel you through an extraordinary number of light layers." “Welcome with love to your White Star Wisdom journey and to your Grand New White-Wisdom Consciousness pathway. It has taken great elements of faith, kindness and hope to reach this point and we are in continued bow to your humble efforts and dedication. 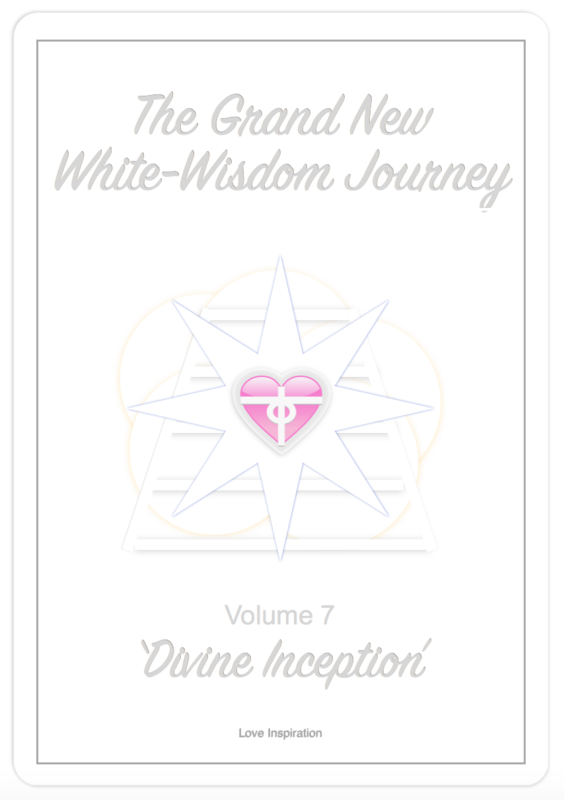 The White Star Wisdom journey here in Volume Five is a further step on your Ascension Pathway, however is sightly more ‘steep' than previously experienced. At the end of Volume Four you completed the energetic frequencies to raise you in vibration enough to reach the Plateau Of White Wisdom. This in itself was a huge achievement. 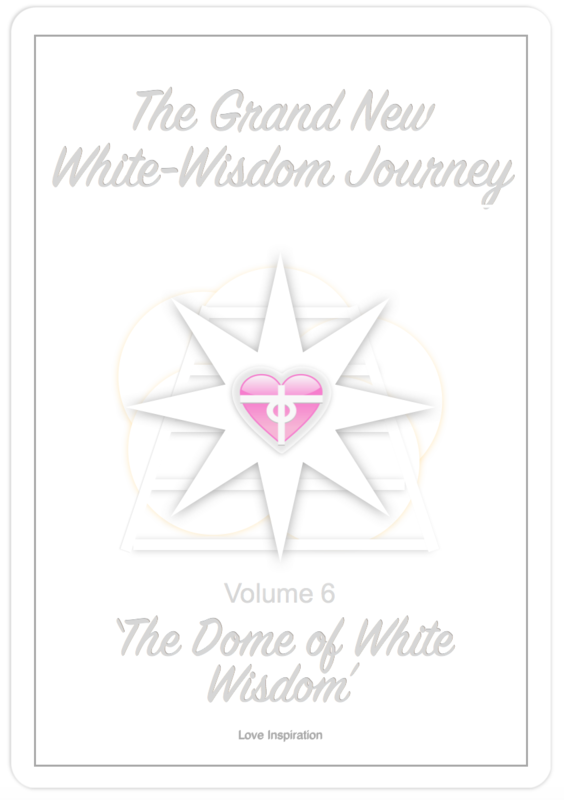 Now in Volume Five you are headed towards engaging in the Grand New White-Wisdom Consciousness through the manifestation of White Star Wisdom. This entails reaching out to the energies of the White Star Wisdom through three phases of practices." “Welcome Dear Ones to The Dome Of White Wisdom. You are welcomed with great austerity and cherishment, for this volume of energies brings you a great and grand step-up in vibration!" "Opening the doorway to these energies invites in the manifestation of Truth-Wisdom and many realisations will flow. As a Truth-Seeker you shall open many new doorways of understandings, whilst also releasing old pathways of doubt, mistrust and lethargy. New Truth-Wisdom instils a new sense of faith, enthusiasm and heart-felt peace, kindness and caring. There are many blessings to be received. Congratulations." “Welcome to Volume Seven - Divine Inception. As the name suggests, this ebook set of energies is manifested as the stepping stone into the new series of Maitri Infinite energies. Here there are immense changes underway as the portal of Maitri Consciousness energies is opened. Divine Inception therefore is the literal ‘inception’ or plantation of the Maitri Infinite ‘seed’ of light within your body." "After six months, this process will be complete and you will be fully engaged and ready to invoke the Maitri Infinite energies and practices in the first Maitri Infinite ebook. With this divine new set of energies being opened, you have now reached a pivotal point on your pathway, for from here on in, the energies shift dimension and capacity significantly. You can be more than satisfied with your accomplishments to date, for reaching this place is a dramatic and committed undertaking."